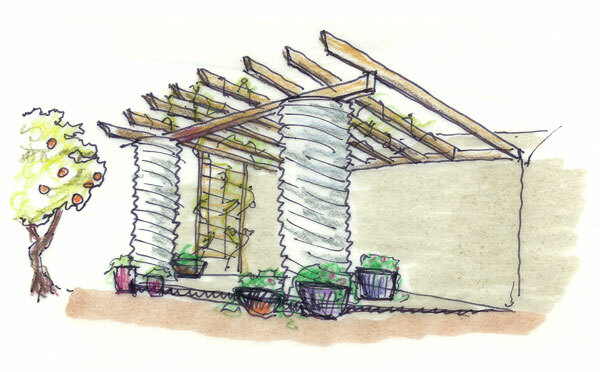 Tucson Rainwater Harvesting, rain barrels, and gutter installation to capture rainwater for sustainable, eco-friendly landscape design in Tucson, AZ. In rainwater harvesting, the term earthworks refers to an integrated system of topographic landscape adjustments that convey, slow, spread, and infiltrate water. Properly designed and constructed earthworks store rainwater in the soil for your plants to access throughout the year. 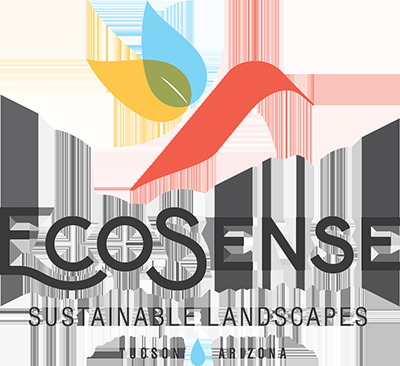 We use engineering analysis to plan basin systems in consideration of available water resources, projected rainfall amounts, and projected plant water demand—creating thriving landscapes that are resilient, support local habitat, and require no municipal drinking water after plants are established. Proper earthwork design and construction are the foundation of any truly resilient landscape in the Sonoran Desert. They offer the biggest “bang for your buck” investment in rainwater harvesting. Well-designed earthworks ensure proper site drainage and can eliminate the need for continuous irrigation with municipal water. They are also critical for protecting your home from long-term erosion and flooding problems. But it’s bigger than just your yard. Did you know that earthworks reduce storm runoff and pollution, provide energy savings, and help restore shallow groundwater and desert stream flow? Read important research from Watershed Management Group and Pima Flood Control here! Did you know Tucson Water customers can receive a rebate of up to $500 for rainwater harvesting earthworks? Monsoon storm rainwater normally shunted off to the street can be stored and put to use in the landscape (or in the home!) throughout the year. Our designs analyze potential rainwater storage amounts and usage demands to create planting, gardening, and food production plans that can be completely supported by rainwater harvesting. While many tank installations may appear similar, our emphasis on design and construction details ensures the effectiveness and longevity of your system. For Sonoran Desert residents, the water supply is anything but certain. The continued climate projections of long-term drought in the southwest, rising demand on the Colorado River, falling groundwater levels, and related price increases should have us looking closely at how our water is being supplied. Did you know that Tucson Water customers qualify for a rebate of up to $2000 for active rainwater harvesting?